Aside from being a noted NAP citation, HomeAdvisor is a popular website for homeowners who are looking for local roofers. A customer will request a job and HomeAdvisor will attempt to match them with the most qualified contractor based on their ProFinder technology. Once a match is identified the consumers’ contact information is distributed to the contractor. In other words, it becomes a lead. Becoming a pro member of HomeAdvisor requires a paid membership. 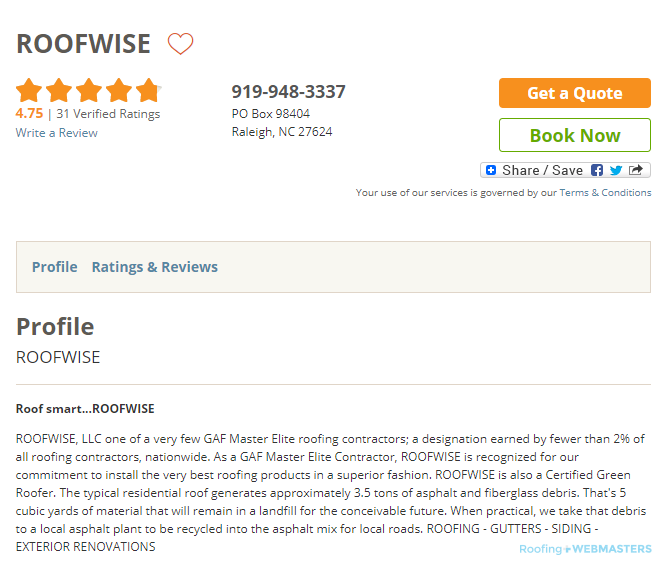 As you might note, HomeAdvisor is an especially beneficial citation to roofers. Not only does your company establish accurate and consistent contact information but it does so on a platform that caters to your target audience. The affect is doubly advantageous, since you establish a credible citation while also increasing your visibility to your target audience. For roofing contractors, local SEO is the driving force of your business success. To be found online in today’s market, you must be optimized for local search. If you aren’t, you are losing out to competitors for hundreds, if not thousands, of potential leads. The good news is that Roofing Webmasters can optimize your local presence rather quickly. We’ll get you listed on all the right directories, and ensure consistent and accurate NAP information. Contractors can claim their free HomeAdvisor listing. Bear in mind, HomeAdvisor offers an additional Pro service, which you don’t have to purchase in order to have a listing. The Pro service is for lead generation, and you won’t need it if you invest in Roofing Webmasters. The leads you get from local SEO will more than make up for the potential leads you’ll get from HA Pro, and our leads are exclusive. The most important thing is to clam and optimize your listing, and ensure it is accurate and consistent. One wrong piece of information can have massive consequences for your company. Imagine posting the wrong phone number on HomeAdvisor. Not only does this confuse customers who see a different phone number on your website and other sources, but it creates a real possibility of you losing out on would-be customers. If they dial the wrong number, their next course of action is often to move on to the next available roofing company. Updated on March 25, 2019 at 8:37 pm by Roofing Webmasters.